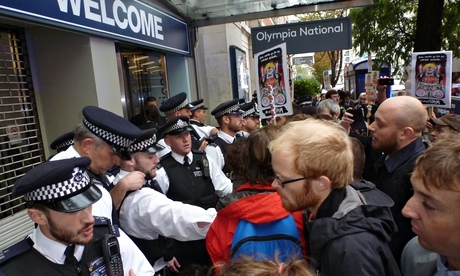 The MIPIM Jamboree last week attracted much protest and media comment, including articles in the Guardian and on the Left Foot Forward blog, which noted that “the Heygate Estate has become the paradigmatic example of the MIPIM-model of property development”. 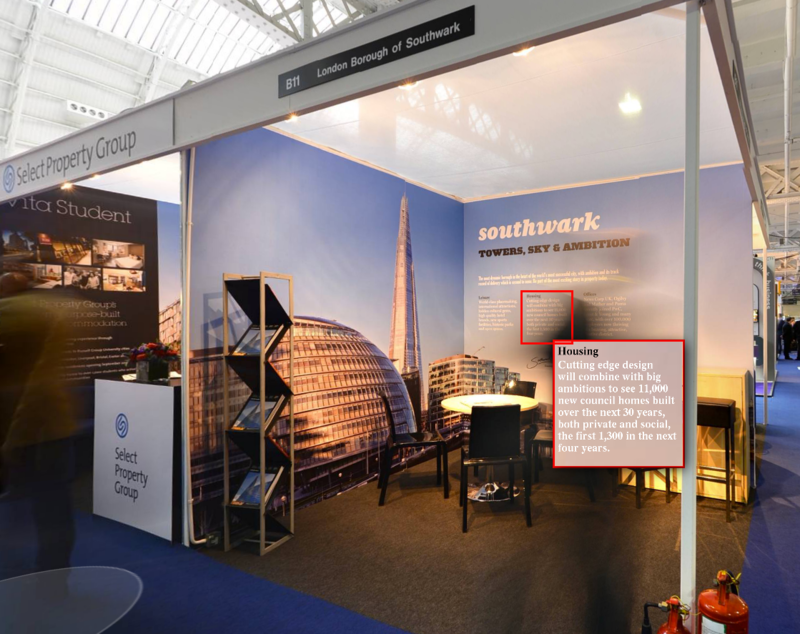 MIPIM itself revealed the contrasting attitudes of 3 London Labour boroughs towards developers: Hammersmith & Fulham used their stand to make a strong case for development that provides “Homes for residents, not overseas investors”. It highlighted developers using “ridiculous viability assessments that offer piffling amounts of affordable homes”. 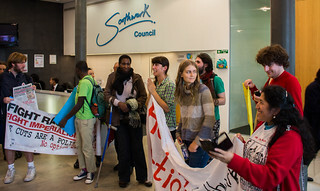 Heckling protesters spotted Southwark’s Head of Property Steve Platts and Head of Regeneration Jon Abbott attending the fair. It’s a day out of the office, but they looked a little downcast; no doubt disappointed that Southwark was beaten by Croydon and Lambeth to the awards of ‘Best UK Planning Authority’ and ‘Best Public/Private Partnership’. If you would like to enjoy the full MIPIM experience without the canapés and champagne, click on this interactive floorplan of the property fair. 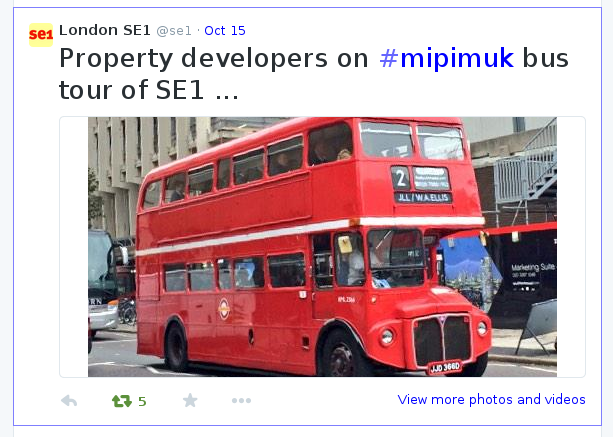 We hope if you live in Southwark, you didn’t see the MIPIM bus driving down your street last week. It was full of MIPIM property developers making a quick trip from Earls Court, no doubt scoping out sites in the developer-friendly ‘can do’ borough of Southwark. The disruptive impact of regenerations like the Heygate and the Aylesbury on people throughout Southwark has become more apparent day by day. It is not just that council tenants lose their homes, but that leaseholders get displaced and that housing and rehousing opportunities are lost for anyone on the council waiting list. The Southwark Group of Tenants Association has called a public meeting about the future of the Aylesbury estate and the demolition of council homes. 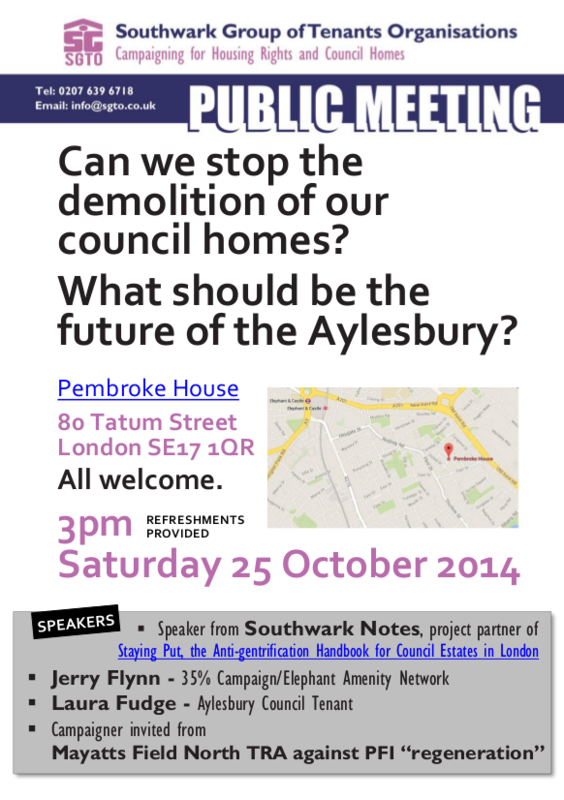 Threatened Aylesbury leaseholders will also be taking part in the meeting. In the meantime - 3 weeks since their submission - the Aylesbury planning applications have appeared on Southwark Council’s planning portal (ref. numbers 14/AP/3843 and 14/AP/3844) but we can’t tell whether the applications meet with affordable housing requirements because there are still no planning documents online. Last week we emailed the council’s planning dept to ask about the delay and we have still had no reply. Parties to the Heygate FOI/EIR Tribunal case reconvened at a ‘Case Management Hearing’ last week. The hearing was called by respondent to the case Adrian Glasspool, who had complained that disclosure of the viability assessment had still not taken place following the Tribunal’s decison at the beginning of May. After hearing an account of progress so far, Southwark, Lend Lease and the Information Commissioner were directed to meet on 29th October to try to resolve any outstanding issues concerning the final disclosure. The judge also asked for parties’ availability for a further hearing - should it be needed - in December. Another challenge against a developer’s use of viability assessments in Stoke Newington can be added to the list of challenges in our previous blog post. Again the developer is arguing that local people simply would not understand what it is all about, just as was the argument in the Heygate FOI/EIR Tribunal case. After 3 days of argument in the High Court, the judge has retired to consider his verdict. “Definitive guidance should be produced to ensure a single and robust methodology for viability assessments to reduce the scope for different interpretations of viability and reduce uncertainty.” It argues that an “‘open-book’ approach to negotiating site specific viability is required, to increase transparency and speed of negotiations.” It also proposes “an arbitration service for S106 on large scale developments to be funded by the parties involved in the negotiation”.